It is hard boiled egg season. If your family is anything like mine, there will be plenty. Little Dude loves to dye them, but to be honest he's not the only one. I love it too and even though they might not admit it I even have a few brothers who still like to dye the eggs too. Luckily we like eggs and use them in lots of ways. My husband and Little Dude like to mash them up with some salt and pepper and just eat them like that. We also enjoy deviled ham and egg salad, eggs in our tuna salad and eggs on salad. But deviled eggs are one of our favorite ways to enjoy hard boiled eggs. The problem is they are so much work! Plus there is the issue of peeling a pretty egg. I can peel a dozen eggs for egg salad, no problem. They will probably look nice too. But tell me I'm peeling them for deviled eggs and I am sure to run into problems. The shells will hold on for dear life and I'll end up with hunks of missing white. Or the yolks will be all on one side, so one wall will be paper thin. Is that just me? So instead of going through that hassle, I make deviled egg inspired recipes instead. I use the flavors I know we love from MiMi's deviled eggs and turn them into other things. 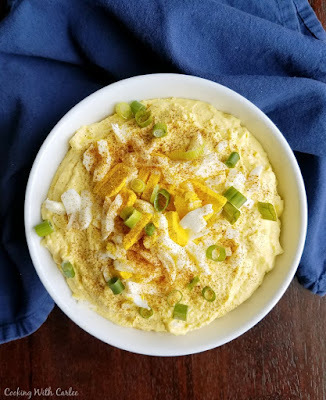 Deviled egg potato salad is a great one and this dip is another favorite. I have made it for our Easter party in years past and it was a hit. I made it again recently for family dinner and I was shocked how quickly the bowl emptied. The bet part is how easily it comes together. The food processor does the heavy lifting, so no perfect eggs required. I like to stir in some chopped eggs at the end for texture. Then just garnish it the way you like your deviled eggs and you are ready to go! What do you do with all of the hard boiled eggs around the house at Easter time? Throw 6 eggs,5 more egg yolks, the cream cheese, mayo, vinegar, mustard, sugar, salt and pepper into a food processor and process until mostly smooth. Chop the 5 egg white leftover from step one and fold into smooth mixture. Spoon into serving dish. Slice or chop final egg and arrange on top. Garnish with paprika and green onion if desired. Serve with crackers, veggies or chips. This sounds yummy. I reckon hubby would like it. Thanks for sharing, pinned to make. Mine loved it, I hope yours does too! Thanks for stopping by! It is so good! I am not great at making pretty pealed hard boiled eggs, so this takes the pressure off. Thanks for hosting! It is so much easier and everyone loved it! Thanks for hosting! So perfect for around Easter. I once made a whole batch of eggs for deviled eggs that just would not peel right - I wish I would have had this recipe! It seems like I can peel eggs just fine until I need them to look nice for something and they everything goes down the tubes! I love the dip because it takes all of the pressure off to get them perfect. Oh this sounds so delicious! Such a neat idea! I am terrible at getting hard boiled eggs to peel nice when I am under pressure, so this is a great way to take the pressure off! Wow Carlee, this sounds really good! Thanks for sharing this appetizer recipe at Cooking and Crafting with J & J. Thank you! I love deviled eggs, but hate having to peel them and make them look pretty so this is a perfect way for me to go! 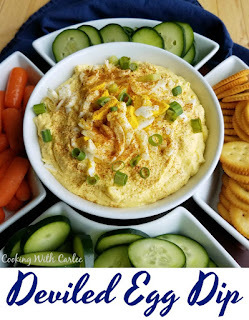 Carlee, this looks delicious, I love deviled eggs and I like the cream cheese twist in the dip. I could make this and then the cake pop fake eggs at the same time that way I could fool everybody with the fake eggs and have the dip on the side so they can get the real thing. The best! That would be very nice of you. I need to make my husband a batch of this to make up for the cake deviled eggs! 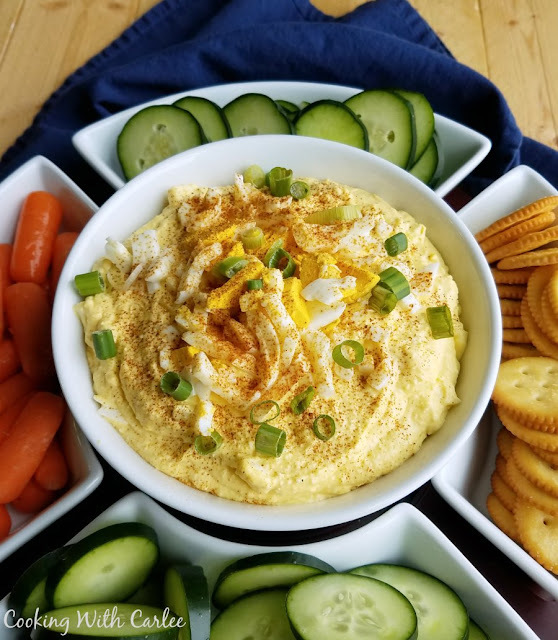 Deviled Eggs in a Dip Form! This is brilliant!! Happy weekend beautiful! Why haven't I thought of this before! 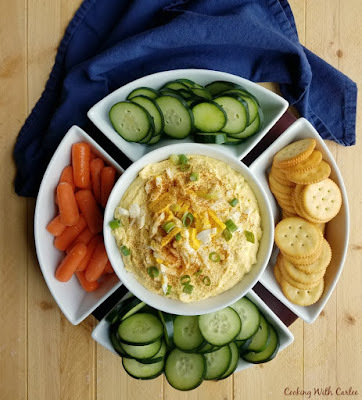 I love it when there is left over insides from making deviled eggs and my family and I will eat it spread of club crackers! This is so much easier than stuffing all of those individual eggs and you get to pick out fun dippers to boot! And those farm fresh eggs are even more problematic on peeling nicely! This is genius. And delicious! They really are, aren't they? Thank you! This is a fabulous idea. We love deviled eggs and this is a way to have that deliciousness in something besides eggs. I had never thought of this, but am anxious to try it. It's so much easier to make for a crowd this way than filling all of those eggs!